The 1-Acts show gives our members who would like to have a go at directing their chance, without them having to take on the responsibility of a major production. Our newest members also have the opportunity to star in these plays to ease them into performing on stage and gain confidence before being cast in one of our future productions. For the past few years Worcester Park Dramatics Society have chosen published plays to perform for our Summer 1-Acts show. This year we have decided to show WPDS’ play writing skills, showcasing 10 short performances that have never been seen before. Each play is between 5-15minutes long and is all original work. It is very exciting for our new drama group, Worcester Park Youth Theatre, as they will be debuting on stage. The cast range from 6-9 years old and can’t wait to open the show and demonstrate all their skills they have learnt since September 2017, when the youth theatre first started. We are now in rehearsal for this production which, amazingly, is only the second Agatha Christie play the society has put on in the last 50 years – possibly ever. The previous one was ‘The Hollow’ way back in 1979! 2017 marks the 90th Anniversary year of the founding of WPDS and this landmark is being celebrated at a dinner dance to be held at Kingston Lodge Hotel on Friday 5th May. Also on Saturday 13th May a special performance of our April production ‘The Garden Party’ will be staged on the iconic Barn Theatre stage at the National Trust property Smallhythe Place, which was for many years the home of the celebrated actress Ellen Terry – quite a challenge and a fitting way to mark 90 years of amateur theatre. Back in 1927 when the society was formed, it was both a dramatic and choral society although any pretence at serious singing has rather been lost in the mists of time! – although we do still have our moments, having staged the society’s first-ever pantomime (why did we wait 89 years?) last November. Over the years WPDS has performed at a number of different venues including Sutton Public Hall, Cheam Baths Hall (a venue The Who played as part of their 1966 tour!) and Marlborough Hall in Wimbledon, but in 1977 we moved to the Adrian Mann Theatre, NESCOT (or Ewell Tech as it was then) and have now performed there twice a year ever since… 40 years in fact, so another anniversary, and probably our longest stay at any one venue! We have been extremely lucky over the years to have had such an amazing mix of talented and enthusiastic members with continued support from a regular audience and we would like to thank everyone, past and present, who has helped make the society a success for the last 90 years – and by the relatively recent arrival of a hugely talented and dedicated group of younger members, the future of WPDS seems assured for many more years to come. 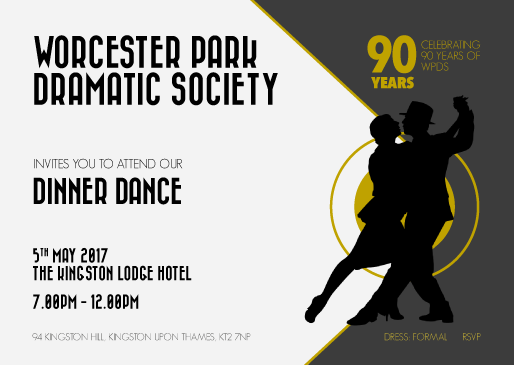 Help us celebrate our 90th Anniversary year by joining us for a dinner dance at the Kingston Lodge Hotel on Friday 5th May. This invitation extends to all members, former members, family and friends. This should be a memorable and classy event, so don’t miss out. As part of our 90th anniversary we are delighted to announce that our Spring production has an extra date. On 13th May 2017 we are taking ‘The Garden Party’ to the Barn Theatre at the beautiful National Trust property Smallhythe Place. This is a special one night only performance in a stunningly intimate theatre. It is an enormous thrill for us to perform at such an atmospheric place where some of the greats of British stage in the last century have performed incl. Sir Alec Guinness, Sir John Gielgud, Dame Sybil Thorndike, Dame Edith Evans, Sir Michael Redgrave and Joan Plowright. We have a super play to take there combining family drama, shocks, revelations and humour, which is sure to please and make for a fantastic evenings entertainment. The delightful house and gardens will be open as usual on the day and it is worth noting they also have some fabulous costumes belonging to the famous Victorian actress Ellen Terry which can be viewed by arrangement with the National Trust in advance. Smallhythe Place was once owned by Ellen and after her death her daughter changed the use of the barn to a theatre. Theatre seating is limited, so book early to avoid disappointment. …As the society continues to go and grow from strength to strength and the dynamics of the society are changing, I thought this was a good choice of play. There was a full range of characters on show and a good mix of age ranges for your actors to enjoy in this 1960’s comedy. I liked the set which was clean, open, fresh and very engaging…The attention to detail was impressive – it was not sumptuous as in some previous productions but reflected the standing of the family and the period they were in. The set design and set building team are to be congratulated. 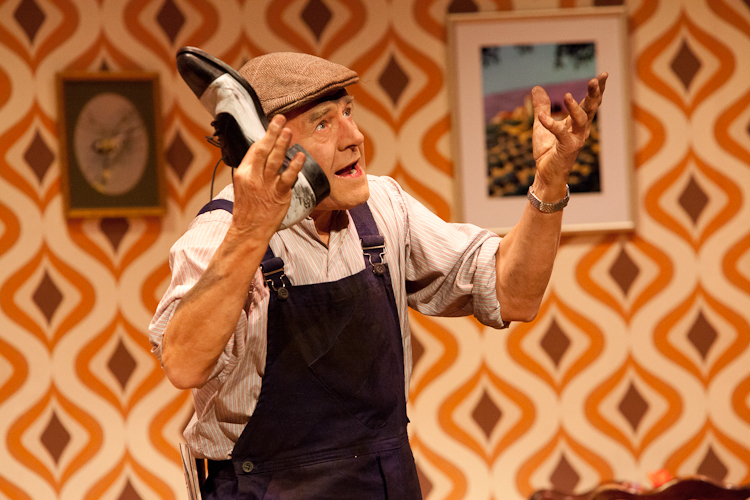 The play itself is a bit of a slow burner, as many are, whilst characters and events are established…It does gain momentum over the three acts as events unravel and this turned out to be a thoroughly enjoyable production. It is lovely to see the integration of new younger members and the more established members playing fabulous character parts. It was particularly lovely to see Hugh Jones play a common man again after many loftier roles. It was the Irish worker and his interaction with various members of the family (and a significant amount of the good stuff) that produced most of the humour as well as the absurdity of the body being found up the chimney. Congratulations to Patricia Dale for directing such a tight and entertaining production. All characterisations were big but stayed within the realms of plausibility. Technically it was all good except for a fleeting moment when Henry had to shout “Lights Malcolm, Lights”. The costumes and props were altogether appropriate and I particularly liked Sybil’s lovely red suit and shoes. The play was well produced and stage managed by Malcolm Stephens and David Wiggins (and his stage crew). The action flowed smoothly with all cast members appearing to be well rehearsed…We were entertained by Harriet Kearsay as Sarah Walling. Kelly-Ann Fernandes as Cynthia Walling, Yvonne Black as Mrs D’Arcy, Patricia Davy as the effervescent Sybil Walling with support coming from Margaret Mason as Det Sgt Hardy (did they have lady Det Sgts in the 1960s? ), Hayley Sponder as Rosita Hernandez and Sophie Mathieson as The Hon. Pamela Colefax – each contributed greatly to the success of the production. Our male participants came in the form of four characters. Hugh Jones was a triumph as the Irish worker Flaherty who made himself feel right at home. Daniel Webb is every inch the leading man and was very easy to watch in his portrayal as everyman Henry Walling. Martin Phillips nicely portrayed Paul Martell and Patrick Morrison put his own spin on Constable Bray. Judging by this production, it looks like it is onward and upward for WPDS which pleases me very much. This could well be a contender for a NODA drama nomination later in the year. Production photographs from our recent production of ‘Brush With A Body’ are now available to view!